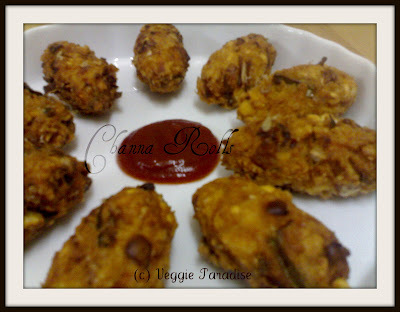 A tasty and healthy tea- time snack.These are delicious rolls made of channa and vegetables. Soak the channa in water overnight or for 8 hrs.Grind them coarsely and keep it aside. Chop the onions , mint leaves, coriander leaves and capsicum finely. Now in a vessel add the powders, chopped ingredients ,grinded channa along with salt and mix them well without water. Make shapes out of them . Mix corn flour with water. Deep fry them in medium flame till they turn golden brown and drain them in a paper towel, to remove excess oil. Very tempting. Like to have it now! Yummyy rolls... looks spicy and tempting.. perfect presentation... gr8 job dear!! nice presentation and crispy snack! Woooow,,,rolls looks very crispy n crunchyy,, looks superb with beautiful click,,, nice healthy snack dear,,thanks for sharing dear,,take care n keep on smiling. these look super tasty..too good. Aruna, yum snack or appetizer. Thanks for sharing. Awesome evening snacks with laods of proteins...i did the same rolls long back,instead of deepfrying i baked them..
My taste bud is wanting them now.Channa rolls are so inviting aruna. 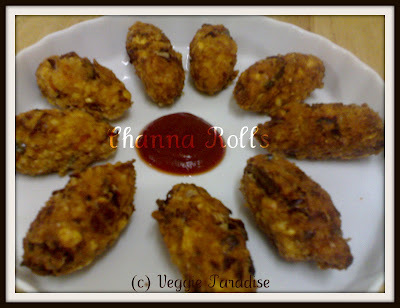 Very innovative and tasty chenna rolls. Looks good too. Channa Rolls looks so tempting and tasty!! perfect with a cup of tea..
this will make a great tea time snack..
Looks very crispy.will finish tat plate with sauce :)nice ntry !! Roll looks yummy and tempting. looks very tempting. Nice tea snack. Lovely blog.